"Thank you for helping us fight the good fight!" 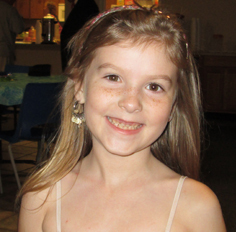 Three weeks before her fifth birthday, Allie was diagnosed with retinoblastoma, cancer of the eye. Only a handful of doctors in the world specialize in this particular type of cancer, but Allie's family was fortunate enough to quickly find one who did. They dropped everything to make that first appointment. "Money did not seem to matter," said Amanda, Allie's mom. "Our only concern was getting our little girl the care she needed." Allie's appointment was in New York, which for her family, was on the other side of the country. They used all of their frequent flyer miles on that first trip and it turned out being a lot more expensive than they ever thought. "We ended up being away from home a week longer than we had planned," according to Amanda. "When we got home from the first appointment, we were exhausted and somewhat traumatized with everything that had occurred. It wasn't long after realizing we would have one of these visits every month did things feel overwhelming." The NCCS helped Allie get the treatment she needed, even though it meant flying her across the country for appointments. "Each time we have another visit scheduled, I get to speak with the same person, who is caring and compassionate, and she asks me what areas I need help with, continued Amanda. "The assistance we get through The National Children's Cancer Society makes these trips a little less traumatic. My little girl is not out of the woods yet, but she is holding her own. Thank you for helping us fight the good fight."